Photographer: Mert Alas & Marcus Piggott. Model(s): Mariacarla Boscono. Source: Vogue Paris. Stylist: Joe McKenna. Makeup: Lucia Pieroni. Hair: Shay Ashual. 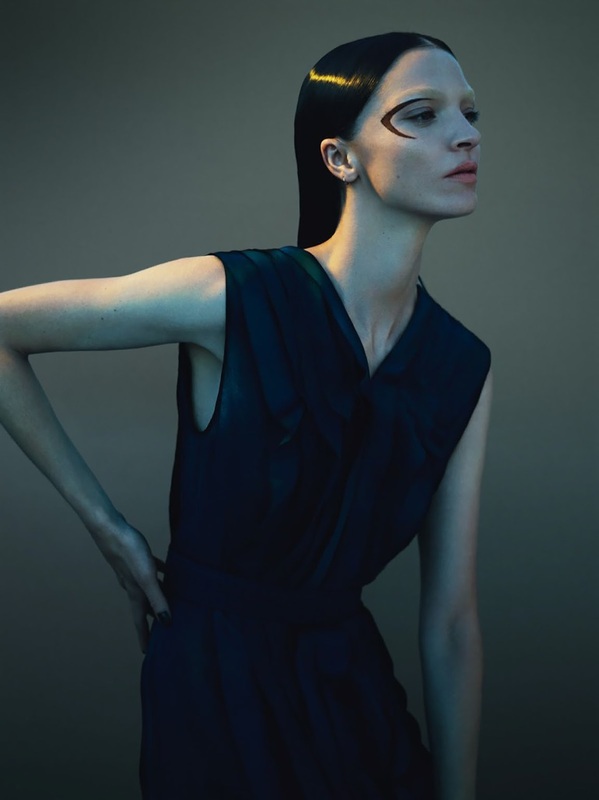 Mariacarla Boscono masters the art of melancholia in ‘Blue Note’ by Mert Alas & Marcus Piggott for Vogue Paris, November 2014. The signs of solemnity speak with dark fashions that hug the female form. Stylist, Joe McKenna, captures the essence of subtle-chic with clothing that evokes a sullen mood. Power ignites as the brutal beauty of bleached out brows sit in silent reverie. Modern makeup shines, as Lucia Pieroni, creates a bare palate quietly inspired by poetic markings. The future of the face is here, with designs crafted to meet at the end of the eyes. Hairstylist, Shay Ashual, slicks back the black dew with locks that fall down in a silkened silence. The heat of passion explodes as this story celebrates the quiet fury of the modern woman.